Further to the success of the Leadership for Good Summer Internship Program last year, we are thrilled to announce Social Impact Internship for Fung Scholars (SIIFS) Program this summer in collaboration with Philanthropy in Motion (PIM). 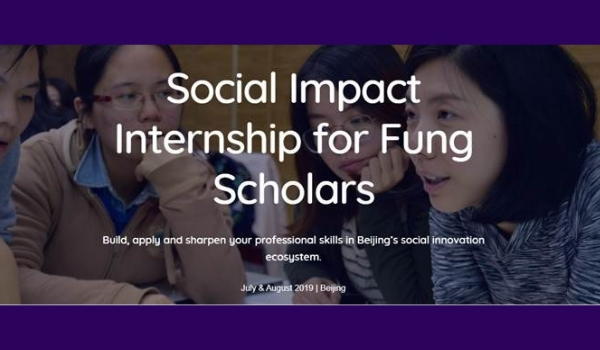 Fung Scholars selected into the program will be placed in innovative social ventures across Beijing, while joining trainings on social innovation, mentorship sessions and a professional community to develop as cross-sector leaders, equipped with the skills to make a difference. The Victor and William Fung Foundation will sponsor up to 8 Fung Scholars (including program fee, travelling, lodging fee and living stipend) to join this informative, meaningful and thought-provoking program. Please click HERE for more details and to submit your program application before the March 15 deadline! Mentorship and peer community focused on social innovation. Potential mentors include professionals in fields such as entrepreneurship, screenwriting, law, consulting and more. To apply, please submit an application HERE before the deadline. Of course, don’t hesitate to reach out to Admin@fungscholars.org with any questions!